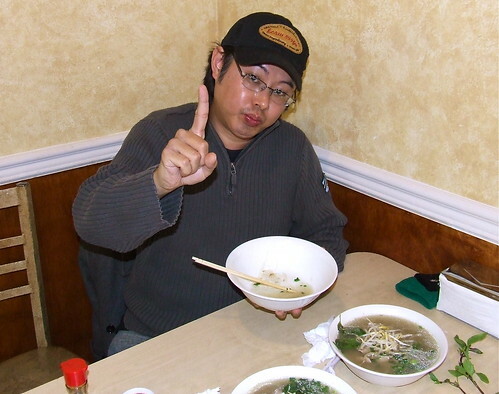 Are You Ready for Some Pho Bowl?!?! 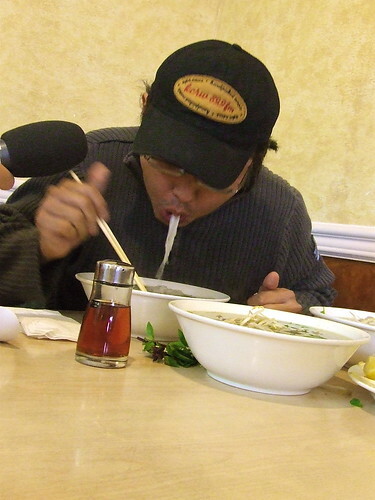 The Pho Super Bowl Challenge. Tune In Saturday 11AM to Good Food KCRW 89.9FM or KCRW.com. The weather was foul that day in Alhambra. Though, not nearly as awful as the blizzard grounding planes at DFW Airport ahead of Super Bowl XLV. But for SoCal it was dreary and wet enough. The rain, however, didn't deter me from the gluttonous task before me. I was pumped, loose and feeling good. Long gone were my days of seeing the all-you-can-eat buffet as a personal challenge rather than just a type of business model for a restaurant. I had retired my buffet sweats years ago. Eating every meal like Joey Chestnut is a young man's game. Not sure why but on that day I was ready to fish out those ratty cotton pants, blotched up with an assortment of mystery stains, from the bottom of my closet. I gulped down a few glasses of water to keep the gut full and stretched. I felt different. Alive. Ferocious. And, really, really hungry. The fire was back in the belly. Soon, this belly would be overwhelmed, no vacancy, completely and 100% engorged like a Korean blood sausage stuffed silly with cellophane noodles. 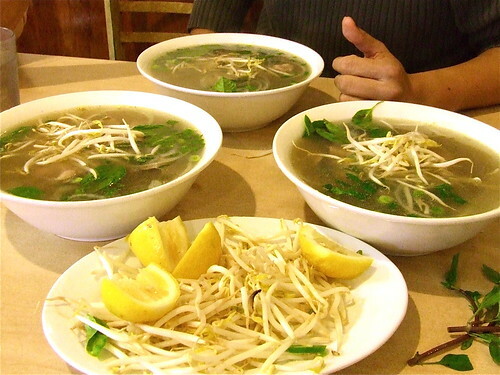 The challenge at Pho Super Bowl in Alhambra, California was simple: polish off 3 large bowls of pho within 1 hour. The large or "Super Bowl" was clearly on the huge side of all the rice noodle soup receptacles I've seen and slurped from. 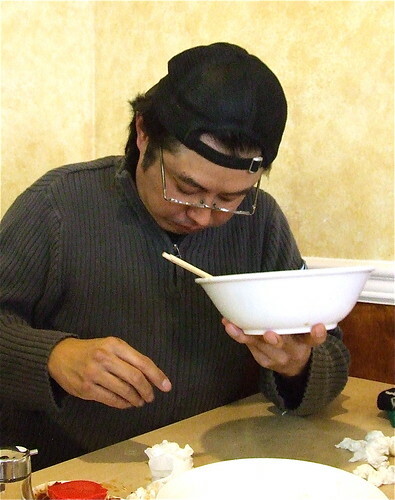 By my estimation, each bowl easily weighed 2 pounds, broth, beef and noodles combined. Harriet Ells, producer of KCRW's Good Food, was on hand to officially document the potential pho fiasco. I said my brief intro into the mic, attempting to tie this exercise in excess to the Big Game. A couple of waiters brought out the enormous bowls. The pho was delicious, especially the broth. It had a deep brown coloring with equally as deep a beef flavor. The first bowl would be a breeze, I thought. And it was. But, I could already start to feel the bloating and the slight discomfort in my stomach from the rice noodles. They felt bigger. They were bigger. The damn noodles were expanding in my stomach, gradually but surely. The strands in the two remaining bowls appeared more bloated as well, growing twice their size in the time it took to finish bowl number one. 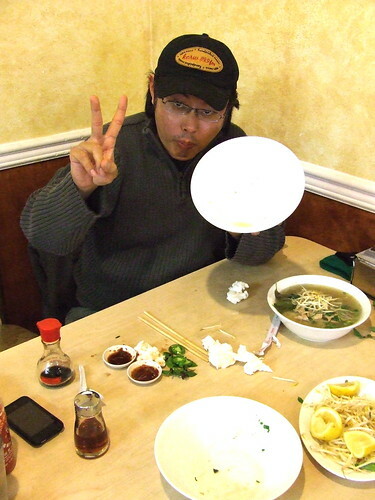 "V" for very sick of pho. The next two bowls were...well, you'll just have to listen to find out. Yeah, call this a culinary cliff hanger. Tune in Saturday, February 5th at 11AM PST to Good Food on KCRW 89.9FM in So Cal or anywhere online at KCRW.com. 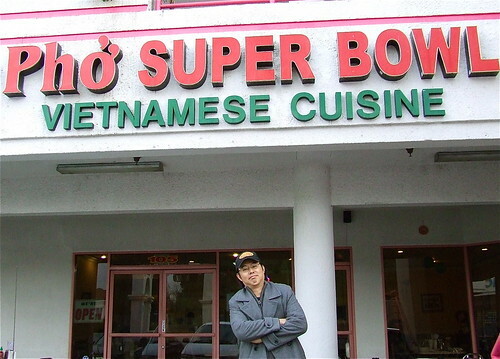 Some food for thought: It takes a super stomach to finish the Pho Super Bowls, but it takes super bowels to get rid of them. BONK!! Hitting the pho wall.